Bamiyan, a flagship site in Central Asia, located on an ancient road between India and China and famous for its Buddhist antiquities, owes its archaeological reputation to the giant Buddha statues (55 m and 38 m in height) carved into the north Great Cliff of the valley. It was also famous for its troglodyte occupation: cells of Buddhist monks, sanctuaries, chapels built into the rocky walls of the Bamiyan Valley and adjacent Foladi, Kakrak and Khwadja Ghar, etc. valleys. According to a Muslim chronicler, there were twelve thousand of these types of rupestrian excavations at Bamiyan - most of the caves being stuccoed and decorated with wall paint or with clay or stucco modeling. The tale of the famous Chinese pilgrim, Xuanzang (translated by Paul Pelliot) who visited Bamiyan in 632 tells of the existence of resplendent giant Buddha statues and a city surrounded by ramparts like the capital of a kingdom (which the Mission calls Z.Tarzi, the “Royal City” or, in French “Ville Royale” = VR) partly backing up against the mountain on the north side. He also tells of several dozen monasteries, one of which housed a one-thousand foot long Buddha lying in a state of parinirvana. Several soundings were also carried out by French archaeologists in cave G, on the citadel of Zohak and Gholghola, but no extensive excavations were conducted. This program was started by Zemaryalaï TARZI, a professor at the University of Strasbourg II, with funding from the French Ministry of Foreign Affairs and DAFA (French Archaeological Delegation in Afghanistan), the National Geographic Society (NGS) and other sponsorship programs via the APAA (Association for the Protection of Afghan Archaeology). The team of excavators is made up of students from the Marc Bloch University (studying for doctorates on Z. Tarzi), members of the IAA and restorers from the Museum of Kabul. The architects are from the Strasbourg School of Architecture. The MZT began its initial excavations campaign in 2002. 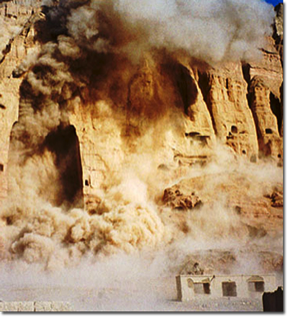 It was the first mission after twenty-three years of civil war in Afghanistan and was excavated continuously every summer at Bamiyan up to the fifth campaign in 2006. In previous campaigns, the MZT excavations, which were the first to be carried out at the Buddhist sites at Bamiyan, whose monuments were built in the open air, have renovated a statuary modelled in polychromed clay with remarkable artistic craftsmanship. The MZT’s great asset is the successful identification of the “Eastern Monastery” in which the great statue of Buddha lying in a state of parinirvana should be found. The estimated date (2nd-9th century AD for the Pre-Islamic period) is important for a better understanding of the artistic school of Bamiyan and its relationship with the Buddhist world. Excavations conducted this year (2006) on the VR 1 and VR 2 sites revealed the ancient Buddhist capital of the Kingdom of Bamiyan and provided us with a complete sequence of the ceramics stretching from the start of Islam to the 15th and 16th centuries, filling in the gaps between the Turkish and post-Ghaznavid periods, especially the Ghurid period. We must not forget that the MZT is an effective centre for training our Afghan colleagues who are learning the techniques of excavation and restoration. I - VR (“Ville Royale” or Royal City). 1st campaign. After clearing the land of mines the previous year, the MZT went ahead without electromagnetic detection or other costly procedures and the following two sites were selected, obtaining the desired results (which were highly satisfactory). VR 1. This site is located to the far west of the ancient bazaar of Bamiyan, now in ruins, on the right side (north) of the Kabul-Band Amir road, where the valley opens out at Tchehelsotoune. As expected by the MZT, it shows how the rupestrian architecture of the ancient city gradually gave way to construction architecture. Next year, in 2007, the MZT will carry out more extensive excavations in this area and hopes that they will be as fruitful as this year. VR 2. This site is located to the west of the great 55 m Buddha’s niche, practically at the foot of the Great Cliff. A set of glazed-ceramics and glass workshops were found buried here, outside the walls, backing up to the ramparts (?). Next year, explorations will be conducted on this site and, if possible, on the sectors inside or close to the royal city. II - MR (“Monastère du Roi Précédent” / “Monastère du Premier Roi” or Monastery of the First or Previous King). In spite of the soundings carried out in 2005, where excavators from the MZT were able to circulate freely with no apparent danger, this year (2006), the site, which is situated midway between the niches of the two great statues that were dynamited, were completely covered by several hundred red and white painted stones indicating the supposed positions of mines. Where did these mines come from this year? Curiously, we have no answer. There is no doubt that next year, in 2007, the MZT will excavate the site (2nd campaign), taking all the necessary precautions in accordance with its predefined schedule following the demining.